The minimum size LONG runner must consist of at least 2-end, enter/exit ramp sections @ $259 each section… as in the first small image under large 3 piece image to the left… add center units to construct the LONG modular system to your desired length. Add 2 additional enter/exit end ramp sections per each additional location you want to place a system. If you need assistance with configuring your LONG Runner, please call 888.302.4857 (10am-3pm M-F) and we will assist you. Order additional 1″ thick inserts here. Fulfillment is 2-3 business days – ships UPS ground from the state of WA. Note: Sanitizer solution not included – SaniStride does not sell or distribute sanitizers. Please see the Setup and Maintenance page for recommendations on sanitizer usage. And be sure to question your chemical supplier regarding the efficacy of the sanitizer you are using. SKU: N/A Categories: all, Runner | Stride Sanitizer Mat 1"
LIMITED INVENTORY on the 1 inch deep Stride LONG Shoe Sanitizer Runner components… some delays in fulfillment could be encountered. We will inform you immediately if there is a several day delay for Stride Long Runner production upon receiving your order. Each base mat piece of the STRIDE-LONG Runner is $259, insert included… as well as the hook and loop strips for holding sections together. 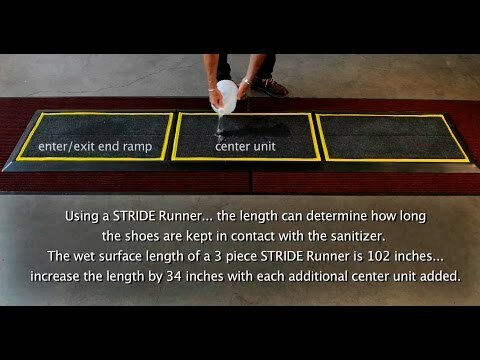 The STRIDE LONG RUNNER is a modular mat system to create a LONG Shoe Sanitizer Runner Mat. The minimum size Long runner consists of 2-enter/exit end ramp sections, with a 1″ wide, 1/2″ high strut between, held together with a loop finishing strip… the wet sanitizer surface is 2-sections of 34″L x 18″W, total 68″L x 18″ and allows 4 stride steps to cross. The ramp around the merged sections is 2.5″ wide, creating an overall outside runner length of 74 inches x 23 inches… 1” is added for each strut in the Runner System. By adding LONG CENTER runner sections L34″ x W18″ wet area, you can create a runner as long as desired… each additional section creates another 1″ wide 1/2″ high center strut. A 2 inch wide loop finishing piece (included and 1 spare) wraps over the adjoining sections and adheres to a hook mate that has been glued to the inside of each 1/2″ high strut. The 2″ loop strip holds the section tightly together. Please see close up of Runner construction picture above or click PDF. The Runner insert is a Sanistride® proprietary design. We suggest charging each 1″ Stride insert with 1-1.5 Gal maximum of sanitizer. Because of our proprietary insert design, there are no waves and little to no splashing making the SaniStride System one of the best sanitizing footbath mats on the market. Sanistride® mats have an easy clean-out protocol: Simply flush/rinse the insert and base-mat with clean water in a utility sink or with a hose. Stand or hang the insert on-end to drain the water quickly and drip dry overnight. If you desire to use the System 24/7, you will want to order a replacement insert with your initial order… it is needed for the cleaning rotation process as one will need to drip dry overnight. Please see the Setup and Maintenance page for more info.